If the architecture of the Orphanage saw Van Eyck 20 years ahead of the educators, this time he was able to work closely with both staff and clients of the Hubertusvereniging. This association was set up in the 19th century to help 'fallen women' and during the 1970s evolved into an institution that took in and protected unmarried mothers on an equal basis. This boarding house, providing temporary lodgings for 16 parents and some 78 children plus staff and administrative spaces, was to fill a gap in a 19th-century street wall and restore two neighbouring historical houses at the same time. The infill conforms in terms of height, general vertical subdivision and basement to the existing fabric, yet deviates radically from it in other ways. 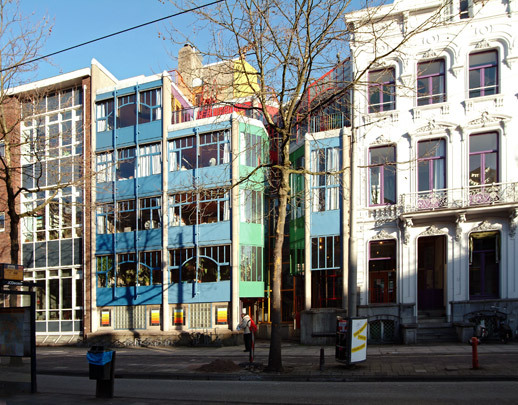 Its entrance and stairhouse are so positioned as to create two buildings: a tall, entirely new block and a less-tall extension to the existing houses, with colour and material acting as unifying elements. The existing premises contain staffrooms and parents' living and sleeping quarters, with their terraces in the new-build. The all-new block contains storage space, a canteen and kitchen and a day nursery for children aged one to six. The two uppermost levels, high up and isolated, are for the babies. A low-rise portion on an inner court has two storeys of dwelling units; each unit houses ten children and consists of a bedroom, toilet and washroom, kitchen and living room with veranda. A tiny passage upstairs links the dwellings to a roof terrace. The structure is a regular concrete frame of columns and floor slabs with a core of toilets and lift. Non-loadbearing walls are for the most part glazed so that the space throughout is easy to read. Both plans and facades eschew geometric regularity in favour of an even distribution of specific geometries: rectangular spaces, 45° angles, circles and segments, and free-form curves in the children's living quarters. During the construction stage, Van Eyck decided to supplement the intended colour scheme of the low-rise (purple, red, orange, yellow and green) by painting successive sections of the high-rise facade in different colours to lend weight to the rhythm of the facade. 'I don't choose colours,' Van Eyck once wrote, 'the rainbow is my favourite colour.' The rainbow motif can be found here more than once.